The sign on the right is what greets you when you go to the doctor's office in Tisdale. Pandemic or no pandemic the instructions given make really good sense and is to the credit of the health region for doing its job to make a visit to the doctor's office a safe visit. 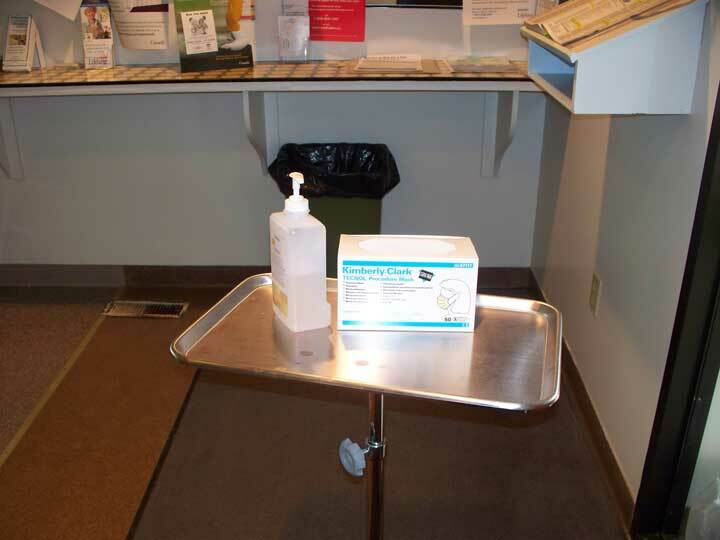 As you enter the waiting room the tray (above) with hand wash alcohol bottle and a box of masks is right there at the ready so that the two ways influenza is spread by actually contact and atomized in the air are looked after. 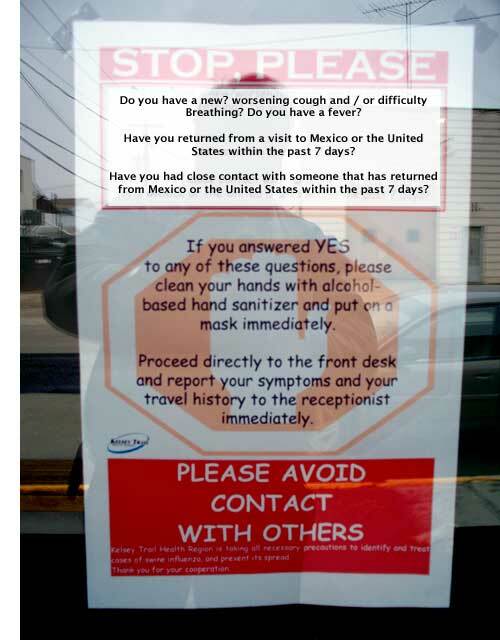 In September of 2003 a wildly infectious respiratory ailment that became known as SARS came to Toronto from China. There were many deaths and serious permanent injuries to health workers as a result of the outbreak and Canada really did a serious study of how the public health and political machinery failed to protect itself and the public. The lessons of that event are being put into practice this year with the emergence of the H1N1 Influenza A strain of flu that seems to have come from Mexico. It appears as though for the older portion of Canada's population the H1N1 Influenza A virus does not pose a serious threat because we old guys may have some resistance to it because of exposure to similar "swine flu" varieties in the 50s and 60s. However, H1N1 Influenza A is still a very serious threat and great care needs to be taken to restrict its spread. What we know about respiratory viral infections is that the virus is remarkably tough and does not die when it is sneezed out of someone with the infection or when it is coughed onto one's hand. Anything someone with the virus who has coughed on their hand, touches will have the live virus alive and well for perhaps even days. For this reason it is a good idea to develop the habit of not covering your mouth when you cough with your hand but instead do so into your sleeve at the elbow. But just in case frequent washing of your hands is an effective defence. If you get the virus on your hand it is only minutes before you touch your face and the infection has a new victim. All of this is true of the common cold and all the other nasty respiratory bugs that are a part of human life. Hand washing and avoiding contact with the virus works. Here is another useful tip. When you visit the doctor's office now or at anytime leave the magazines right where they are. Since people go to the doctor's office when they are ill they can pass on what ever they have to the magazines and you pick it up and you will expose yourself to their infection. When you use a public washroom wash your hands before you leave but use your paper towel to deal with the door handle because it is remarkable how so many people do not wash their hands after going to the bathroom. David Butler-Jones, Canada's chief public health officer has been quick to point out that Canada's public health agencies are in good shape and are ready to deal with this virus or others that come along and we should not think that just because most cases of the H1N1 Influenza A virus are mild it can kill anyone of any age. We can all learn from this event, awareness of how disease spreads is perhaps more important than immunity. One of the reasons for the tragic and formidable spread of Polio during the 40s and 50s was because the public and public health authorities just did not know that Poliomyelitis was being spread by feces in ditches and the failure of people to wash after going to the bathroom. Even though we have wide spread immunization for the disease public health standards of today are unlikely to permit a disease like Polio to spread today as it did fifty years ago.